working with Australia’s leading organisations. Temporary or Permanent working visas with a sponsoring Australian employer such as the subclass 482 (TSS), 186 or 187 visas. Options for family members of Australian citizens or permanent residents including partners, parents or children. For skilled workers without an Australian employer sponsor, including the subclass 485, 489, 189 or 190 visas. Australian Visas investors or business owners like the subclass 188 visa and subclass 132 visa. 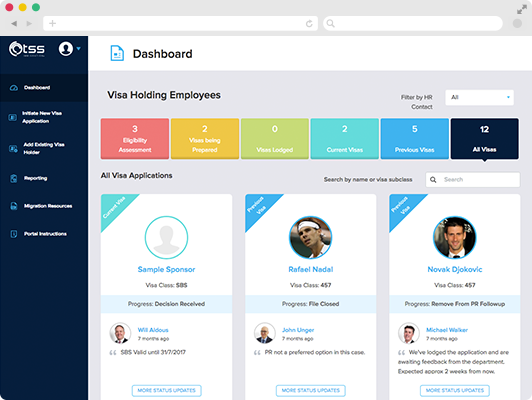 Our easy to use online system has benefitted from over 5 years of development, as well as the use and feedback from some of Australia’s largest employers of sponsored visa holders. Without proper LMT evidence, a TSS visa application can fail, costing businesses essential time and money. The Medium and Long-term Strategic Skills List (MTLSSL) includes a set of skilled occupations available for work on the following visas: 407, 489, 485, 457, TSS, 189, 190 and 186.